The cannabis industry may be legal and flourishing here in Oregon, but when it comes to allowing people to consume in social and commercial settings similar to wine-tasting rooms, beer gardens and microbreweries, the state has more to accomplish. 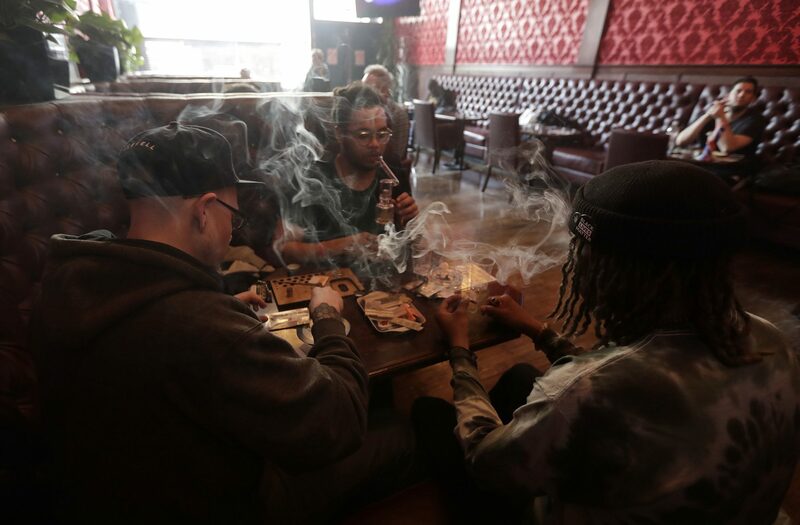 A new campaign is underway to spur momentum for legalizing cannabis consumption spaces in the 2019 legislative session. The campaign kicked off officially at an event in late August, hosted by the newly formed New Revenue Coalition, a political action committee composed of cannabis industry businesses and allies with the mission of legalizing common consumption spaces for cannabis in Oregon, and state Sen. Lew Frederick. Frederick plans to sponsor a bill addressing the issue when the legislative session begins in January. This isn’t the first time a bill addressing public consumption has come to the Legislature. In 2017, Sam Chapman, legislative director of New Revenue Coalition, authored a Senate bill to exclude cannabis from the Indoor Clean Air Act, but after three different work group meetings the bill was so compromised from its original form that it didn’t move forward. That said, Chapman is optimistic that now is the time to bring it to the table once more. “We believe it’s a new day and we genuinely want to come back to the table with public health and determine what their concerns are, and to the best of our ability make sure those concerns are addressed within the legislation,” Chapman said. According to Chapman, this time around the focus is on social equity, as too many individuals are without a place to safely and legally use cannabis due to restrictions on rental units and low-income housing, an issue that disproportionately impacts the poor and communities of color. This fall, Chapman and the coalition were reaching out to several social justice groups and tenants’ rights groups to find out whether people were getting evicted over consuming cannabis. According to Chapman, who also owns New Economy Consulting, a firm that advises investors and entrepreneurs in the cannabis industry, the only place you can consume cannabis legally is in the privacy of your residence. And that has caveats, because most likely, unless you live in a cannabis-friendly rental or apartment building, which are few and far between, you have to own that residence. So, the answer is another bill, which is slated to be introduced in January by Frederick, who was on hand at the event last August in Portland. Frederick, who says he has more dispensaries in his area — District 22 in Portland, including the airport — than any other area in the state, has already been working on other cannabis-related issues such as decriminalizing and expunging records of individuals with nonviolent marijuana convictions. Despite that, Frederick said, people are beginning to recognize that cannabis is an economic engine that does not need to be stopped or inhibited by rules or regulations that don’t fit the industry. Yet he acknowledges, until there is a way to measure how much a person is impaired when they consume cannabis publicly — much like a breathalyzer for alcohol — the discussion will continue to be on the table. It is clear people are coming into the state specifically to consume, and as a result, the push to figure out the parameters on how to consume publicly is strong. “We need to make sure we are paying attention that people are coming into Oregon just for this industry, and how do we address this in a way that is going to be effective,” he said. Frederick said he wouldn’t be surprised if the issue went to the voters, and he added that the bill will likely be revised from its current state. “I hope we are able to make the case well enough,” Frederick said, adding the decades-long stigma of marijuana is still an obstacle for some legislators to change their minds. The early draft of the bill has three pillars, according to Chapman. First, the coalition wants to allow for cannabis consumption to occur at retail facilities. For example, a retailer (such as a processor, producer or a dispensary) could have a separate space off the sales floor where customers could consume, to mimic a vineyard-type model. This would allow a retailer to provide samples and limited sales, similar to the way vineyards and breweries operate. The second pillar of the bill is creating temporary licenses for cannabis events, which is essentially, according to Chapman, how alcohol is handled. Instead of a beer garden, however, there would be a cannabis garden set up, with security checking for identification and trained servers to make sure people are not being overserved. The third pillar, according to Chapman, is expanding upon delivery, because it is not currently legal to deliver cannabis anywhere but someone’s legal address. “If the Jupiter Hotel in Portland wants to allow cannabis to be delivered to their hotel, they should be able to do that,” Chapman said. In addition to those three pillars, Chapman stressed legalizing public consumption is an equity and accommodation issue, as people in subsidized housing and living under other rental restrictions need a safe place to responsibly consume cannabis. “We are addressing the inequity and lack of accommodations by creating licensed and regulated places for adults to consume cannabis, which under current law, does not exist,” Chapman said. Marsh said there needs to be some standards concerning public consumption, much like how alcohol is served in bars, but it’s not as straightforward. If the obstacles for measuring the parameters for intoxication were removed, Marsh thinks some of the communities in her district would be in support of having public consumption spaces for cannabis. State Sen. Alan DeBoer of Ashland said he’s concerned with public consumption spaces, but the issue will have to contend with the Oregon Indoor Clean Air Act. DeBoer also points to the issues the cannabis industry contends with due to the plant still being classified as a Schedule 1 drug, making it federally illegal. He said the federal government needs to allow banking to legitimize both for taxes and safety.